Save $1 or $1.50 on any Cottonelle product. Save $0.75 on Royale Tiger Towels, 6 ct or larger pack. Save $0.75 when you purchase Royale facial tissue, 6 pk or larger. Save $1 on SpongeTowels Ultra paper towels. Save $0.75 on Royale Velour bathroom tissue. Save $1 on Purex Bathroom Tissue 12-roll and larger. Western Canada only. Save $1 on Purex bath tissue, 12 rolls or larger. 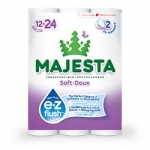 Save $1 on Majesta e-z flush product. Save $1 on Royale facial tissues, Velour bath or Tigertowels 6 pk or larger. Save $1 on Royale facial tisuues 6 pk or larger. Save $1 on Royale TigerTowels 6pk or larger. Save up to $1 on any 3 boxes or bundle of Kleenex facial tissue. Save up to $2 on any Cottonelle product. 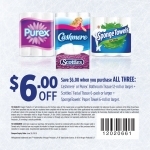 Save $1 on Royale bathroom tissue. Save $1 on Majesta e-z flush bathroom tissue. Valid in Atlantic Canada only. Save $1 on Scotties facial tissue, 6pk or larger. Enter the contest and print $1 off any Royale Velour bathroom tissue coupon. Save $1 when you buy Cashmere,Purex,Sponge Towels or Scotties Envirocare product. Save $1 on the purchase of Royale Facial Tissue, 9 count or more.